The assassinations in Paris last week brought sadness to many people the world over. However, far fewer have ever read the weekly satirical magazine of cartoons, comic strips, news articles and analysis, or even any other comics or cartoons by the murdered cartoonists: Cabu, Charb, Honoré, Tignous and Wolinski. This has not stopped many from publicly commenting on it in blogs, in opinion pieces for news magazines and on radio and television shows. Too much of the public commentary so far appears to be focusing on the same, few, decontextualized images, circulated ad nauseam around the web. The editors of European Comic Art, of which I am one, published an article by Jane Weston in 2009 on Charlie Hebdo. The same themed issue of the journal, focusing on caricature, includes an interview with Cabu* about his entire cartooning career, which had already spanned more than six decades when his life was tragically cut short on January 7, 2015. Cabu and Wolinski were the oldest and most famous of the five Charlie Hebdo cartoonists who lost their lives on that day. 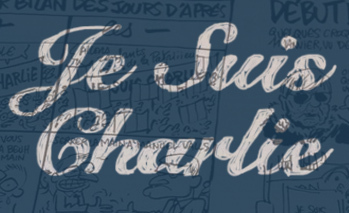 Their murdered colleagues – Charb, Honoré and Tignous – were also very talented cartoonists. It is revealing that the cartoons, but not the comic strips or the prose articles, of Charlie Hebdo have been flying around the world and turning up in attempts to analyze the meanings of Charlie Hebdo and the work of its cartoonists. One explanation is, of course, the easy availability of cover illustrations, which are quickly scanned and uploaded to the web, where they can be consulted by virtually anyone with a computing device and a connection. Another is the fact that relatively few people bought Charlie Hebdo, with sales no doubt mainly limited to people within France. Luz bitterly and ironically alludes to the magazine’s recent financial problems in a strip, titled “Premier bilan des jours d’après” [First accounting of the days after] in the first post-attack issue of the magazine: on the positive side, he notes, Charlie Hebdo was given a huge financial subsidy after the tragedy, allowing it to print a record-breaking number of copies of this issue. In the facing, negative column, he draws bodies and blood on the floor after the merciless killings. Commentators have probably felt free to string together arguments quickly about the meanings of Charlie Hebdo‘s work because the cartoons that have been circulating appear to be transparently, universally readable. In some measure this is certainly due to the simplification of visual artistry that is in the very nature of caricature. However, much vital information has been lost in many of the attempted analyses. Although Charlie Hebdo‘s cartoonists comment on world events, their primary audience has mainly been French, and even arguably Parisian. Many of the cleverly allusive and punning visual and textual references in their cartoons (but also in their comic strips and prose) have been to events in those spheres, that is, to French debates about culture, politics and society, to intellectuals and politicians residing in Paris, or to the latest national bestseller. But when many analysts see the cartoons, they simply lack the artistic, cultural and linguistic frameworks for interpreting them. This even goes for someone as visually literate, artistically brilliant and politically relevant as cartoonist Joe Sacco, commenting on Charlie Hebdo‘s cartoons right after the massacre. What he does in his comic-strip commentary on Charlie Hebdo‘s cartoons, and what a wide array of analysts (some with impressive academic credentials) have done in their articles, is to decontextualize them, in effect stripping the cartoons out of the complex French debates in which they originally intervened. They have also failed to account for the ways in which these cartoons (as well as the comic strips in Charlie Hebdo) fit into the history and present practices of cartooning in France. In an ironic twist, such analysts have caricatured the caricatures and the cartoonists of Charlie Hebdo. This has produced some breathtaking reversals of reality, for example, turning anti-racist, left-leaning people into reactionary racists, and their cartoons into a kind of visual hate speech. Such gross mischaracterization of the politics, cartooning and journalists of Charlie Hebdo blithely ignores decades of anti-racist, pro-immigrants’ rights, and anti-far-right cartooning, reporting and even political organizing by the magazine’s journalists, including its cartoonists. Certainly, there are those who will be shocked and angered by at least some of what appears in Charlie Hebdo, if they choose to pick it up and read it, or to look at its imagery online. Its vocabulary has always been raunchy, to say the least. One of its specialties is scatological humor, and violently sexualized depictions abound in the magazine. Willem, originally from the Dutch underground comics scene, has been able to publish cartoons in Charlie Hebdo that he could never include in the daily newspaper Libération, for whom he also works as an editorial cartoonist. Arthur Goldhammer has astutely traced the lineage of this type of satirical cartooning from Charlie Hebdo back to pre-revolutionary caricature against the French monarchy. And Bart Beaty has suggested another important context for understanding the cartoons in Charlie Hebdo, by referring to the vast array of different comics and cartoons by Cabu and Wolinski, who were considered to be living national monuments of cartooning in France. Adam Gopnik has written about Wolinski’s hedonistic, atheistic approach to life. Luz, whose late arrival at the office of Charlie Hebdo last Wednesday allowed him miraculously to escape the massacre, has published comics with the French alternative comics group L’Association, perhaps best known abroad for having published two brilliant autobiographical graphic novels: David B.’s Epileptic and Marjane Satrapi’s Persepolis. Luz’s published works with L’Association include Cambouis, an autobiographical account of his participation in the massive left-wing mobilization in 2002 against Jean-Marie Le Pen, then the leader of the xenophobic French National Front party, who had managed to make it into the second round of the French presidential elections. Riss and Richard Malka also published comic-book satires of the upward ascent and seemingly insatiable appetite for power of Nicolas Sarkozy. The former French president apparently broke protocol at the massive commemorative march in Paris on Sunday, by slipping into the front row of current heads of state, thereby ensuring that he too would share the limelight. Luz too loves to mock Sarkozy in caricature, as a Napoleonic, megalomaniacal midget, in strips and then books such as Robokozy, recalling the film Robocop (Sarkozy had been in charge of the French police forces too, as Minister of the Interior). Through their cartoons, comics and news articles, the journalists of Charlie Hebdo courageously carved out and defended a space for dissent from religious extremism and censorship. Their joyful mockery of religious dogmatism is viewed as insensitive at best, and even blasphemy, by some clerics and their followers, and, as we now know, by terrorist murderers. One example of such irreverent, even scatological humor is a comic strip by Luz satirizing the Vatican under Pope John Paul II. It was serialized in Charlie Hebdo in 2004–5 and then published by L’Association in 2010 as Rouge Cardinal. The lawyers of Charlie Hebdo won several court cases when conservative Catholic and Muslim groups challenged the cartoonists’ right to caricature religious figures and texts in ways that they felt to be inappropriate. Charlie Hebdo won those court cases. Scholarship on comics and cartoons can help us understand the meanings of Charlie Hebdo in important, vital ways that simply skimming over a few cover images from the magazine will never do. To the dead and the wounded, to the grieving survivors of those massacred, we owe at least this: a genuine attempt to understand what the cartoonists of Charlie Hebdo did, and why. To that effort, scholars of comics and cartoons can contribute much. For my part, I believe that we owe the entire Charlie Hebdo team far more than that. Je suis Charlie, moi aussi.